My last day in Juneau was last Wednesday and it was sunny. The high was forecast to be in the high 70’s. When cruise passengers disembark they are greeted by numerous booths offering a variety of sightseeing options if they haven’t already signed up on their ships. Here’s a sampling. 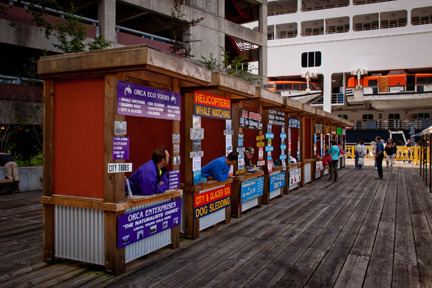 There are booths like these at several locations around the docks. 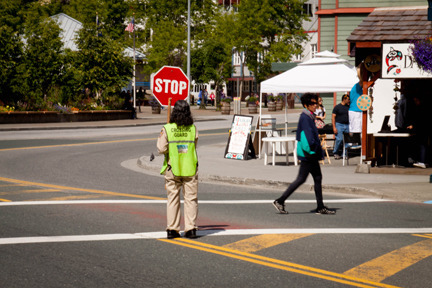 Other than a school crosswalks when was the last time you saw a crossing guard at a downtown street? 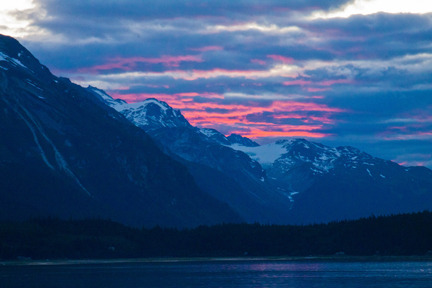 One of the best known glaciers is north of Juneau. It’s the Mendenhall glacier. 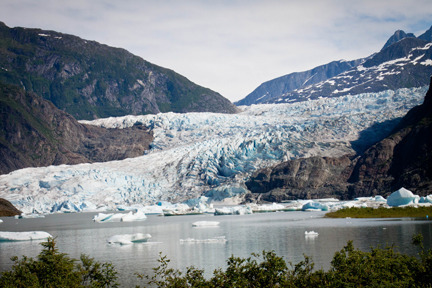 The Mendenhall is a section of the Juneau icefield. It is not a separate piece of ice but is one finger of a larger icefield that has numerous other glaciers coming off of it. The icefield actually covers something like 1500 square miles. The Mendenhall is a part of that. 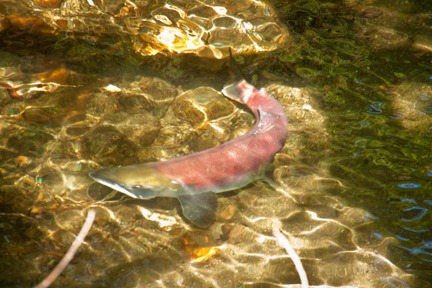 When I got off the shuttle at the Mendenhall glacier there was a nearby stream with red salmon in it. That’s where this photo came from. After Juneau I had a ferry ride back to Haines where I picked up my truck and headed northwest toward Tok. 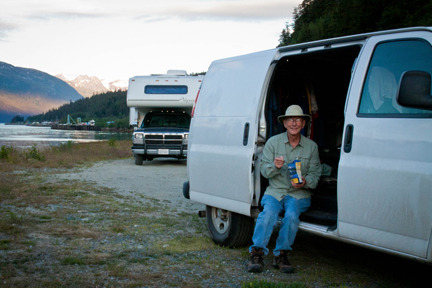 As I’ve traveled I’ve spent most nights at roadside pullouts like this one near the ferry terminal. Often there are other campers there but not always. Here it’s dinner time and I’m enjoying a nice bag of beef stroganof. Actually, I’ve found the freeze dried dinners to be pretty good. I have a Jetboil stove that heats 16 oz. of water in about two minutes. Pour it into the bag, close it and leave it set for 8-9 minutes, stir and enjoy. This was also the location I got my only sunset so far. 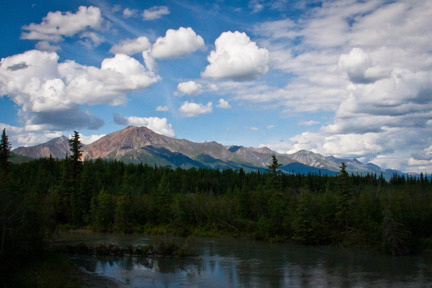 The drive between Haines and Tok took all day. It’s about 400 miles. Here’s a scene along the way. Truthfully, if you stopped a took a picture of every great scene you’d never get to your destination. It’s one continuous calendar scene. The following photo was taken as I approached Anchorage. 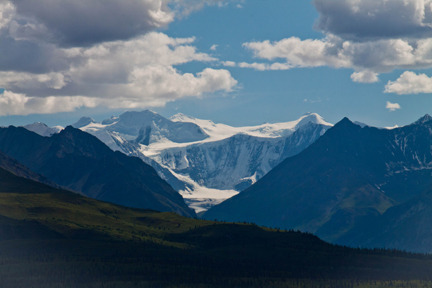 There are several mountains in this range that are 12,000 to 16,000 feet.